At great risk to our own personal safety, our last two articles had to do with the heavy hand of the IRS and our efforts to "ABOLISH THE IRS". It's too soon to tell whether we will pay a price for our audacity to challenge Goliath. Nevertheless, to further our efforts we created special lyrics to a Youtube video entitled "The IRS Blows My Mind" to the song, "The Windmills of Your Mind." You'll get a kick out of it. But this week we delve into the heavy hand of government on private citizens and in this case a Virginia farmer. His story should send shivers up and down the back of every American but only a very few will see the whole picture and what it foretells. The farmer couldn't believe what he was hearing. He talked to others and they couldn't believe it either. But we can believe it, because that is where America is today. It has gone way beyond George Orwell's 1984. It is moving backwards towards the 1930's Nazi state. The environmental police have invaded every level of government, politician and bureaucrat alike and the law and the courts uphold these environmental takings and attacks on constitutional property rights. In any event, the farmer found out about our organization from a referral and visited the NARLO website. He called us on our 1 800 line and we talked for about a half hour. We told him about some of his options and some of the people he could contact for help. We talked about how the city folk and the powerful environmental organizations were using government to drive this unconstitutional environmental insanity down our throats and how rural landowners were a disenfranchised, unrepresented minority with almost no chance of redress against government, unless we get together to fight this gross injustice en masse. He was very grateful to know that there was a national organization out there that was concerned about the plight of the rural landowner. 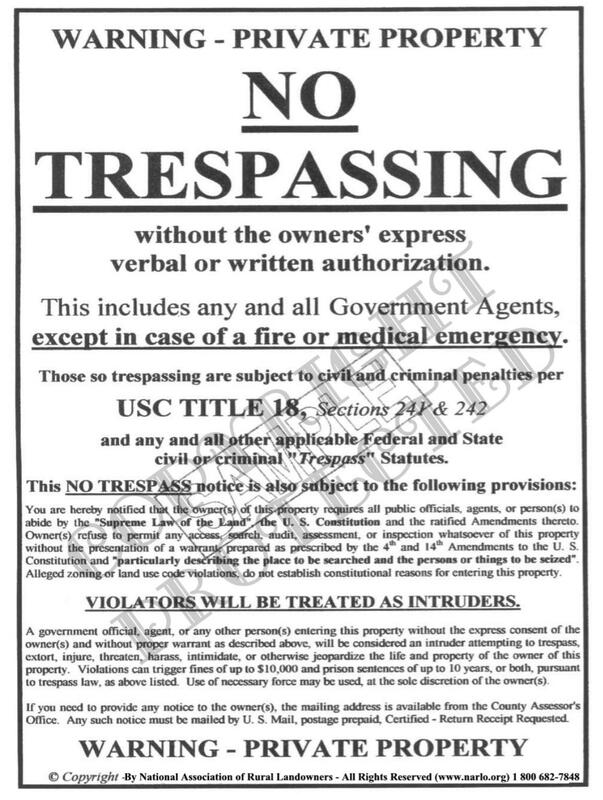 He couldn't wait to join our efforts and purchase our powerful, legally intimidating, constitutional No Trespassing signs. To add to this story, we uncovered a draconian Bill in a state legislature that almost became law this year. It pitted neighbor against neighbor. Essentially, the law would not only authorize but encourage neighbors to sue their neighbor in any state court over a perceived environmental code violation. It also authorized monetary damages and attorneys fees for the plaintiff. We have no doubt that these liberal legislators will push the Bill until it does become law, to pander to the environmental lobby, to which they owe so much. It will also be done to send a message to all who would dare violate the cult of environmentalism. Comply or suffer dire consequences. This kind of draconian environmental insanity is going on in every local law-making body, every state legislature and the U. S. Congress, every single day. It will continue to GO ON until rural landowners and urbanites wake up to the vicious attack being perpetrated on them by a government that has lost all allegiance to the U. S. and state constitutions. If we do not hold this government to its constitutional limits, there will be NO limits on government power, whatsoever. SWAT teams have been raiding farms and businesses all over America. They are raiding milk farms that set up raw milk coops. They raided Gibson Guitar because Gibson was allegedly using some environmentally protected wood from Madagascar, or something. They weren't using the protected wood but that didn't matter to the raiders. The owners of Gibson were heavy contributors to the Republican Party and the raid cost the company well over $2,000,000. Unfortunately, capitulation to government was still cheaper than fighting them, in spite of what they had spent. The other guitar company, heavy contributors to the Democrat Party, was not raided. The Bureau of Land Management (BLM) used hundreds of heavily armed agents to oversee the removal of cattle from government land, which almost resulted in all-out shooting war between government and civilians in a lonely stretch of Nevada at the Bundy Ranch in April of 2014. And this battle with government is not limited to property rights, milk, cattle, or protected wood products. All of the major issues facing Americans today have their foundation in mostly unconstitutional law, or purposely ignoring existing law. Illegal immigration festers in the minds and bank accounts of millions of Americans because government won't comply with its own law. Now, illegal aliens are a protected class of people who have rights that are superior to legal Americans and to which sanctuary is given by many jurisdictions. (See "Illegal Aliens Have More Rights Than IRS Taxpayers.") It appears that Trump is changing these egregious violations of law significantly. Health care, after Obama Care, has become a massive boondoggle perpetrated on all Americans by your government that now appears politically unfixable. The final result will be a one-size-fits-all, government-run, health care system. If you are rich, or a working stiff, you will get to pay for all those irresponsible free loaders that don't know the meaning of personal responsibility. Racism is rising dramatically all across America, thanks to a government and one political party that find benefit in pitting Americans against each other on racial issues. If Americans are fighting each other, they won't be fighting the government. More people than ever before are on food stamps and other government assistance programs. Homelessness is on the rise in one of the richest nations on earth because government, mostly Democrats, decided to mess with the capitalistic system by tweaking it to the point where it doesn't work anymore, in the grand pursuit of votes. Government continues to push the fraud of man-caused global warming down our throats and forcing us to limit our lifestyle and pay huge climate change taxes to allegedly save the planet from the scourge of mankind. But the real goal is control of the masses on a planet-wide scale. With the help from environmentalists and a sympathetic U. S. government, the Indians are using environmental law and perverting the language in ancient treaties to expand their reservations and take over water rights on a regional and sometimes on a statewide scale. Our public schools and colleges have been so corrupted and brainwashed by political correctness, multi-culturalism, collectivism and one ideology, Progressivism, that the free exercise of thought has been essentially eliminated. The United Nations, a totally socialistic organization of over 190 nations, most of which are dictatorships, has inserted itself into American sovereignty and law such that the Constitution has become irrelevant. Christianity is under a wholesale attack in America in order to placate and pander to Islam, radical Islam and hopelessly corrupt Muslim nations. If the Democrats, the "Deep State Bureaucracy" and the news media are successful in bringing down Trump, it will probably spell the end of the conservative movement for a hundred years, if not forever. This is truly a national battle because all of what we see at the state and local levels is filtering down from Europe, the United Nations, the U. S. Congress and filthy rich social and environmental special interests. We can fight locally, but we are only fighting a symptom, not the root cause. It is like taking an aspirin for a brain tumor. We either beat this evil at a national level, or lose everything at the state and local level. We must coalesce on a grand scale at a national level, or we have no hope of arresting this head long, downhill slide into the abyss of socialism, radical environmentalism and ultimately a police state, if we aren't there already. If you are looking the other way and most of you are, hoping that it will not reach out one day and "touch" you, you are living in a virtual dream world that has no basis in reality. But that is exactly what the German people did in the early 1930's. And don't think that just because you live in a city that you are immune to what is now being visited upon the rural landowner or the business owner. Perhaps you have forgotten about government eminent domain abuse, health care and the fraud that is man-caused global warming regulations, levied upon you by your benevolent, they-know-what-is-good-for-you, all-wise government. Or maybe you have forgotten that government lies to you all the time and government can't manage anything without screwing it up, or spending four times what the job is worth. Or you continue to look the other way while your taxes on everything keep going higher and higher, unless of course you are homeless, or on food stamps or other government assistance, or some illegal alien living the good life on your sweat, blood and tears. That's right! If you will just keep your head down below the weeds none of this will catch up to you, but you see ladies and gentlemen, it has already caught up to you. You just don't know it yet. (Need we mention the IRS again?) But we can tell you that the farmers and ranchers of America know it because they are constantly in the gun sights of an ever-more tyrannical government, driven by international, socialism and radical environmentalism. Just ask the Virginia farmer we chronicled in this article. But then you are free to believe whatever you want to believe because after all, it's a free country, that is until a SWAT team comes marching up your front and back porch with a warrant for your arrest because you accidentally violated some law you never heard of before. You ask, why do we always dwell on the negative? That is because negative issues overwhelm the positive issues and nowhere near enough Americans will raise their heads above the noise level to fix or eliminate all the negative things in America that should be fixed or eliminated, so that the positive things can shine through. You may not LIKE what we say here, but that is our reality whether Americans choose to acknowledge it or not. To all those that have fallen in the name of freedom, we honor and salute you on this Memorial Day 2017.